The City of Sainte-Anne-de-Bellevue is located on a place of passage used by Amerindians before the arrival of Europeans on the territory. It bears the names of Tiotenactokte (in Algonquin: Here are the last encumbrances) or Skanawetsy (in Iroquois: Eaux vives). These two words illustrate precisely the particular geographical situation of what will become Sainte-Anne. At this time – and still today – the rapids were popular fishing grounds given the quality and quantity of fish available. Samuel de Champlain is the first known European to have visited and mapped the region when he came up the Ottawa River in 1613. The natives who guided him knew the strategic importance of this point at the confluence of the Ottawa River and the St. Lawrence River. This indigenous heritage is highlighted by the City at Kelso Park, where a white pine tree was planted in 2005 as part of a cultural exchange program between Kahnawake and the City of Sainte-Anne-de-Bellevue. In 2017, the City inaugurated a commemorative plaque in honor of the Mohawk Nation at the same location. This plaque is part of the City's commitment to educating citizens and visitors about its history and milestones and expresses our alliance with the Mohawk Nation and our shared commitment to the environment. The alliance is also asserted by the Mohawk language used on the plaque to pay homage to members of the Mohawk Nation studying at John Abbott College and McGill University. The parish dates back to the year 1663 and is originally located at the tip of Baie d’Urfé (now Pointe-Caron). Bishop de Laval went to the top of the island in the company of Abbots Berny, priest of Lachine, and Dollier de Casson, Vicar General, to determine the limits of Mission St. Louis. The latter comprised the entire end of the island including Pointe-Claire, Île Perrot, Soulanges, Vaudreuil and Île aux Tourtes. This mission was served by Abbot François d’Urfé (whose name the nearby city of Baie d’Urfé now bears) and it was maintained as such from 1677 to 1703, the year of the appointment of the first resident parish priest and the opening of the parish registers. Canonical erection of the parish takes place on September 20th, 1685, under the name Saint-Louis-du-Bout-de-l'Île. Between 1672 and 1680, King Louis XIV of France, orders the parcelling out of this part of the Island in fiefdoms, one of which is granted to settlers and is named Bellevue Fiefdom. The parish is later named Bellevue in after the fiefdom. The name Sainte-Anne, on the other hand, is given under most interesting circumstances. Early in its history, the mission has to retreat as it is subjected to unrelenting threats from the Iroquois. Abbot d’Urfé transfers the registries to Lachine and the mission settles at the head of the rapids, near the forts of Senneville and Île-aux-Tourtes. Abbot de Breslay continues the missionary work of his predecessor, Abbot d’Urfé, in the small local chapel. Eventually, the chapel becomes too small because of a growing influx of Iroquois settlings near the forts. Around 1712, returning from a nightly visit to the sick, Abbot de Breslay was caught in a severe snowstorm. His spooked horse goes astray and throws its rider on the ice. Despite this unfortunate incident, a broken leg and no rescue to rely on, Abbot de Breslay vows to build a chapel dedicated to St. Anne if he makes it alive. When he regains consciousness, he is astounded to find himself in his bed, unaware of how he got there. From then on, he hastens to make every effort to fulfill his promise, and soon after, the first church known as Sainte-Anne is built close to the shore. Beginning in the late 1780s, Scottish immigrants, associated with the North West Company, moved to Sainte-Anne-de-Bellevue. Simon Fraser (1776-1862), a major fur trader, owns a house built around 1800. In the early 1830s, the sector acquired an industrial vocation. In 1831-1835, Edward Thomas Jones built a flour mill on a site rented by Sulpician lords. The site, located on the edge of the rapid on the site of the current lock (at the height of the rue de l'Église), is developing quite rapidly. A few years later, the flour mill is surrounded by several buildings, including a forge, a wood shed, a warehouse and a mill used for crushing and carding wool. In 1840-43, the Sainte-Anne-de-Bellevue lock is built. The chosen location runs along Edward Thomas Jones' water and flour mill canal. The work allows the construction of a stone masonry lock. The canal is delimited upstream by conductive boxes and a wooden pier which extends to the head of the rapids. Downstream, another pier leads to the lock. Opened in 1843, the canal and the lock are the gateway to the Ottawa River and plays a very important role in Canadian maritime trade. The canal is then the only access route to the Great Lakes and is part of the Montreal-Ottawa-Kingston waterway. Throughout the 19th century, raftsmen parade aboard rafts made out of wood from the Outaouais or Gatineau forests. Tens of thousands of passengers pass through the canal on steamboats. The opening of the canal promotes the development of the locality. In 1845, the municipality of Sainte-Anne-du-Bout-de-l'Île is created. The Village of Sainte-Anne-de-Bellevue is founded on April 18, 1878. The Village is incorporated as a City on January 12, 1895, under the Act 58 Victoria chapter 56. In 1891, the Canadian Pacific installs a railway bridge over the Sainte-Anne Canal, parallel to that of the Grand Trunk. At the end of the 19th century, the shores of Sainte-Anne were sought after primarily by the English-speaking Montreal bourgeoisie, who turned it into a holiday resort. In this, Sainte-Anne follows the movement that affects the entire west of the island: nautical clubs, hotels, tennis courts and golf courses testify to the scene of the summer activities of that time. On the other hand, in the early twentieth century, the huge campuses of MacDonald College and John Abbot College changed the social and urban dynamics of the village. Staff attached to these institutions settle either in buildings reserved for them or outside the campus, thus increasing the local population. Although the village is growing, it is confined in its expansion to the southern part of the territory, since the large institutional owners - the campuses of the two colleges and the Morgan Arboretum - occupy a large part of the territory. Stop point because of the locks, but also because of the presence of two railway companies, the Canadian National and the Canadian Pacific, Sainte-Anne becomes a small animated city: factory, mill saw, cinema and hospital military settle there. In 1917, the Federal Government erected a hospital for veterans of the First World War, the Veterans Hospital. The Garden City Press, which prints valuable technical journals, moved into the city in 1919. In 1918, the Garden City Press, an important business in the urban and economic history of Sainte-Anne, distinguished itself from conventional businesses. It is a textbook printer and educational material for workers set up by J.-J. Harpell. He chooses the site according to the many advantages that the municipality offers. Although far from downtown Montreal, the site is close to two railroads that cross the area and allow for fast shipments across Canada. This businessman is influenced by the theories of the British Ebenezer Howard, who proposes the organization of garden cities to eliminate the insalubrity of cities. In this spirit, Harpell wants to help his employees acquire a property and he pays attention to the land use planning surrounding the plant. In 1918, streets, parks and urban infrastructure were developed and 25 houses were built near the printing works for the workers. 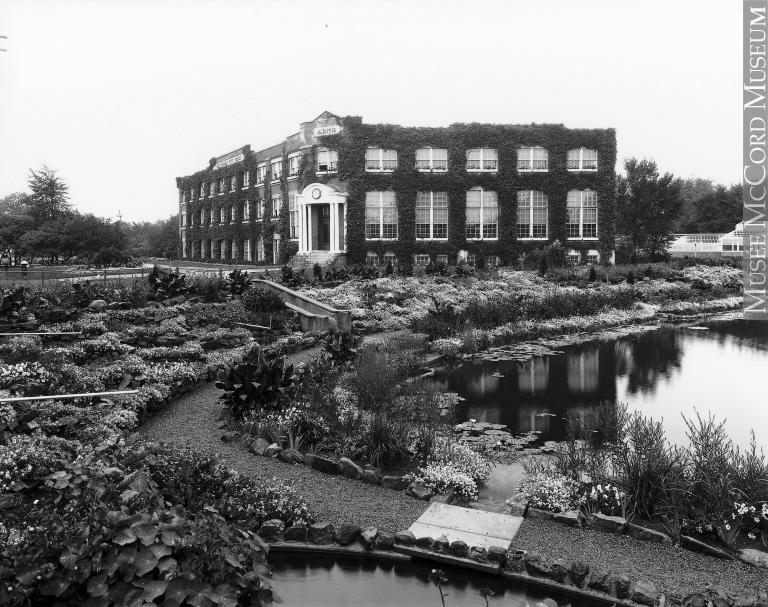 During the Great Depression, Harpell hired unemployed people to plant trees and asked Frederick Todd to create a luxurious Japanese garden with a pond in front of the Garden City Press, of which unfortunately nothing remains today. In 1945, he transferred control of the company to a worker cooperative. In 1924, the Government of Quebec built the Galipeau Bridge overhanging the Sainte-Anne Canal and linking Île Perrot to Sainte-Anne-de-Bellevue. The railway having supplanted navigation as a means of transport, the canal and the locks are changing their vocation. Today, cruises are offered to visitors and the locks are used by boaters. In the 1960s, buildings erected in the 19th century were demolished and replaced by others, which are still in place today. In 1987, a pedestrian and bicycle walk was set up along the canal. In 1987, a pedestrian and bicycle walk was set up along the canal. The municipality of Sainte-Anne-de-Bellevue becomes part of the City of Montreal in 2002. Five years later, Sainte-Anne-de-Bellevue is reconstituted into an autonomous municipality. The evolution of Sainte-Anne-de-Bellevue has advanced by leaps and bounds in the last century. Today, thanks to Pierre-Elliott-Trudeau Airport in Dorval and daily visits by boaters from Quebec and the United States, the four corners of the world are at our footsteps! Images representing the evolution of Sainte-Anne-de-Bellevue over time. This plan by Henry W. Hopkins in 1879 shows the development of the village of Sainte-Anne-de-Bellevue near the canal. The railway cuts the village in two parts: firstly, Sainte-Anne "upstairs", the original nucleus to the west, and secondly Sainte-Anne "down", to the east, new construction. The location of Sainte-Anne-de-Bellevue at the confluence of Lake St. Louis and Lake Deux-Montagnes makes it an ideal place for fishing. At the time the streets were still in the ground at Sainte-Anne-de-Bellevue. Here we see Sir Vincent Meredith's car and president of the Canadian Pacific Railway Richard B. Angus' riding car. Left to right; standing: non-identified, sitting: M.Angell, M.Isidore Pilon, M. Emmanuel Crevier, M. Victor Cardinal. From the book Lake St. Louis Old and New Illustrated and Cavelier de La Salle de Désiré Girouard, 1893.